The 7"-release features a white sleeve with a group picture (Pål, Morten & Mags - this picture has been printed back-to-front) by Just Loomis which has a dark blue outline drawn round it. 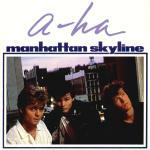 Above the picture is the song title written in dark blue lettering and the "a-ha"-logo in purple hand-written style writing above. The reverse of the sleeve is also white with a small picture of the "Scoundrel Days" album and part of the word "Manhattan" printed in large blue letters across the bottom. Additional information on tracks etc. is printed in blue and black letters. The tracks on the 7" include the edit version of "Manhattan Skyline" (4:11) and the "Live Version" of "We're Looking For The Whales" (3:50) recorded in London on 19th January '87. As with many of the 7" singles, there are versions available with different coloured labels including white, silver and blue. There is also a limited edition 7" which has an identical sleeve except for the fact that the sleeve is actually a large poster folded up to make the cover. The fold-out poster consists of a large black and white band-shot (14" x 21") by Knut Bry, while the reverse offers three individual black and white photos (by Barry Plummer), plus an additional multicolour group-shot. The 12" -release has the same sleeve as the 7" except that "(Extended Remix)" is printed under the title. The extra tracks are listed along the bottom of the sleeve. It features the "Extended Version" of "Manhattan Skyline" remixed by Mags Pål and Gerry W.W. Kitchingham (6:46), the normal LP Version plus the live `full length' version of "We're Looking For The Whales" (6:53). The 12" also comes with a limited edition personality poster (Pål, Morten, Mags). There is also a limited edition 12" picture disc. The front of it is white with a different group picture (Pål, Mags & Morten) in a blue rectangle while titles are in purple and blue above. 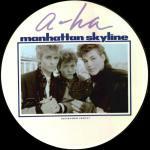 The reverse of the picture disc is white with a smaller colour picture of a-ha in front of some mountains, "Manhattan" is written in large blue letters underneath while the a-ha logo is in purple and track listing is in blue and black. The picture disc has the same tracks as the 12". Italy: There is an Italian juke box promo 7" with b-side Jody Watley - "Looking For A New Love", it comes without a picture sleeve. Japan: The 7" has a similar cover to the UK release but with red and black Japanese writing and details about the b-side written in purple along the bottom. 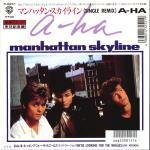 There is also an extra black "a-ha"-logo printed in block letters at the top right hand side of the sleeve. The reverse features lyrics in English and Japanese, plus small adverts for the "Scoundrel Days" and "Scoundrel Club" albums, a small group picture and tour dates '87. The 7" features the full length live version of "We're Looking For The Whales". USA: 12" - Item to be confirmed. Italy Manhattan Skyline (Edit) / We're Looking For The Whales (Live) 928 405-7?